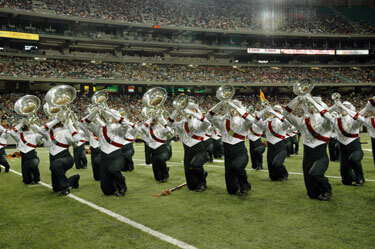 The Madison Scouts have hired Matt Gregg as the corps' program director for 2007. The Madison Scouts back field during the corps' performance at the Georgia Dome in Atlanta on July 29, 2006. "Matt Gregg's involvement with the corps can only mean great things," said Corps Director Mark Dunton. "His longevity with the organization, coupled with extensive knowledge and incredible ability to work with diverse, creative and talented people make him the perfect choice for this role." Gregg is the associate director of bands at the University of Wisconsin-Platteville, where he conducts the symphony band, pep band and marching band. Read more on www.madisonscouts.org.